Don't forget that you have through Thursday night to enter my first give-away right here!!! 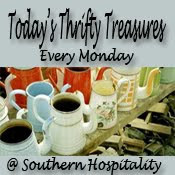 I am linking to "Southern Hospitality" for "Today's Thrifty Treasures" and also to "Met Monday" over at "Between Naps on the Porch". Thanks to Rhoda and Susan for generously hosting these fun parties. This week my shopping trip to "Longleaf Antique Mall" in Alexander City was dedicated to the guest room make-over. I purchased several accessories to add to the things that I will be reusing. Before I show you this weeks treasures, I will give you a quick update on the guest room. I have finished reupholstering the headboard and also added some trim. Two pieces of furniture are wearing new decorative paint finishes and I am currently working on the last two pieces. I still need to make two chair slipcovers and also make two pair of new drapes! Whew!!! This has been more work than I thought. I hope that I can share the new room next week. This blue beaded candle cup was only $1.00!!! This grab bag of orange and brown napkins was $1.00. They cleaned up nicely. Now I get to iron them...not my favorite job. They will be great for fall and the orange ones are perfect for "Auburn" meals. This white fringed hand towel with the pretty pink embroidery will be going into the guest room. And this lovely vintage towel holder will have the honor of holding the white and pink towel! This is the tippy top. I'm lovin' the finish! Can any of you creative folks think of another way to use this towel stand. I usually have ideas - but, I have nothing! 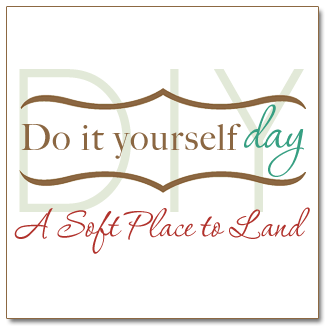 On Wednesday night, I will be linking to Kimba for her "DIY Party" at "A Soft Place to Land", and also to "Transformation Thursday" at "The Shabby Chic Cottage". Thanks you wonderful hostesses! I also had time for a quick project this week. These plaques will also be used in the guest bedroom. These thoroughly countrified plaques were half price!!! My sister gave me these beautiful mini posters. There are six in the series. They were too thick, so I made copies to use for this project. After cutting them out, I covered the plaque with Elmer's School Glue. Carefully place the copy to the plaque. Start in the center using gentle pressure to burnish it down. This allows you to work bubbles to the edges. I had to hold the brush straight up and push down to insure that the paper followed the contour of the plaques bumpy surface. This is what not to do!!! And I knew better! I just had to use my finger instead of the brush to smooth one tiny area and the print WILL stick to your finger and stay there!!! Thank goodness, I had made two copies of each print. Next, I applied a layer of "Deco Art's One Step Crackle. Use a sponge brush so that you don't get bristle marks. The more you use, the larger the cracks will be. It's hard to see the tiny cracks that appeared on the surface. I used burnt umber acrylic paint for my antiquing agent. I applied it with a paper towel. I immediately wiped the surface with a damp towel, leaving the color in the tiny cracks. Now, you can see all the small cracks. I like the small cracks better than the large ones. It reminds me of the crazing that happens naturally to old china. I hung this finished one in the guest bathroom just to see how it looks. Thanks for visit!!! Please say something! It really is encouraging to read the comments. Hi Rhonda! Thank you so much for your lovely visit today! We love what you did with those plaques!...fantastic! Stop by tomorrow, Monday, and play Junkin' Monday with us...our readers will love to see all your oldies! 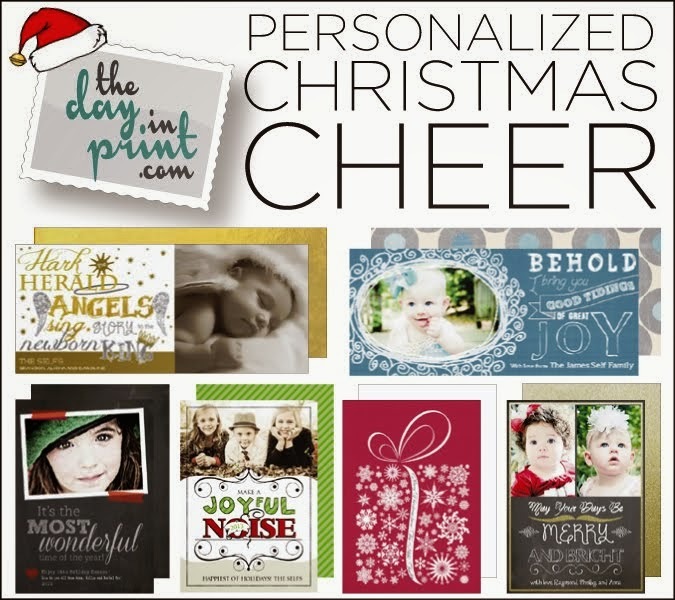 Very nice finds, Rhonda! Love your towel holder that is really cute. Thanks for joining the party. Did you know your blog is looking really wonky?? There is all sorts of html script at the top when I open up your blog. Not sure what is going on. So super cool finds ! Love the tiles ! I am so excited to see the big reveal! The anticipation is killing us all!!! I love the blue compote! And that towel holder is really neat. Love those tiles---thanks for sharing how to do them!! The towel holder is cool too! I do love the blue compote! Thanks for sharing the how-to on the plaque project ... came out really nice! Can't wait to see your guest bedroom. Beautiful! What a great idea!! I just LOVE it!! I love that blue compote and the towel holder is to die for. I possibly hate you for having it... J:) Just kidding, good for you! Those are some great finds. Great finds.........so happy to find your blog. LOVE LOVE LOVE the towel holder...what a fabulous find that was!!! the blue compote is so pretty too!!! That towel stand is TDF fabulous! Love it! Just to respond to your post on my blog, your header looks fine to me! Your plaques are fantastic! Talented girl! I'm so glad I discovered you, I'm a fan now! I like the colorful salt/pepper shakers and the $1 napkins! You are one nifty momma! 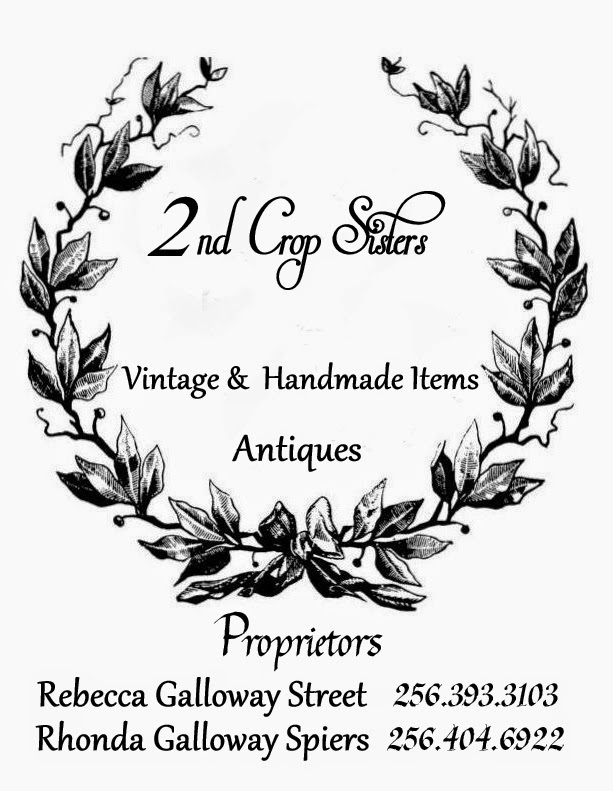 I'm so glad you came by for Junkin' Monday. You also found great stuff. Oh boy , would I love to get my hands on that awesome towel holder...amazing find Rhonda! What a wonderful project to share with us all. It turned out so beautiful! LOVELY finds! And your art project is sooo pretty! Very nice! Your make-overs are always wonderful! War Eagle Baby!! Steve told me I would have been miserable if I had gone in the stadium so I was good with watching it at Moe's. We still had all the atmosphere, but not the sticky wet bodies!! LOL I wish I had known you were there!! I love the plaques. You did an amazing job. I love the small cracks too. That towel holder is stunning, and so different. Hey!! Oh how I love what you did!! And I love the towel holder, too! I wonder if it could be used as a wreath holder as well? This looks wonderful. This was very resourceful and fun!